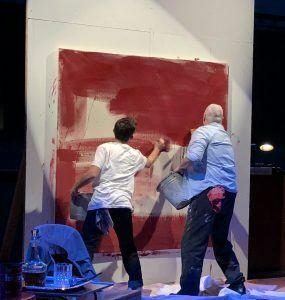 “Red“, John Logan’s Tony Award-winning play about abstract expressionist painter Mark Rothko, opens tonight on the stage-on-stage at the Bankhead Theater. If you don’t have tickets, get them now … this is truly a play worth seeing. 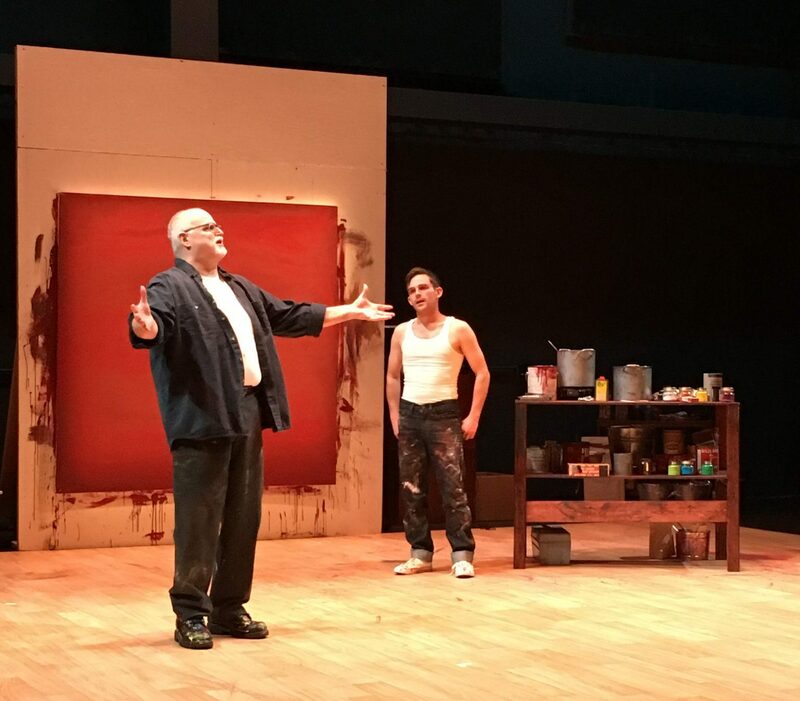 Our team has watched as this powerful play has emerged – from the first read-through to last night’s dress rehearsal – in much the same way a Rothko painting emerged as he applied many layers of precisely-tinted color. “Red” is a remarkable five-scene window into the heart and soul of an artist at work – a gifted, passionate, tortured mind wrestling his art to life. Rothko verbally clashes with his assistant Ken, yet each takes away something from the other. 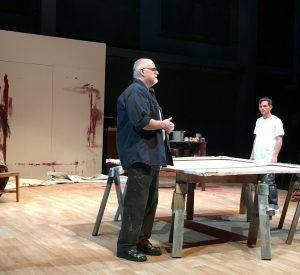 Poised at an important moment in the history of art – as Abstract Expressionism was giving way to Pop Art – the play shines a light inside the mind of an artist driven by his artistic ideals. The intimacy of the stage-on-stage setting at the Bankhead, makes the play even more compelling. The raw industrial feel of the walls and lighting evokes Rothko’s studio. Seated just feet from the action in the acoustically-beautiful space means the audience is part of every word, every breath, every emotion. Viewing art in a museum, especially Rothko’s commanding canvases, can be a transformative experience. Watching an artist at work provides a view into artistic creation. But seeing into the soul of the creator yields an understanding of the value and meaning of art that goes beyond what the eye can see. “Red” provides that inner view of art in a way that will remain with you forever. *Member of the Actor’s Equity Association, the union of professional actors and stage managers. One of the first things Rothko asks Ken when they meet is “Who’s your favorite painter?” It’s a flashback for me. When I was 25, I had a “final” interview for a high-tech marketing job. It was with the vice president, several levels up, a final sign-off before an offer could be made. He was well-known for being critical and difficult, and I felt intimidated walking into his office. But the first thing he asked was “Who’s your favorite artist?” which led to a fascinating discussion about finding inspiration in different types of art. A couple years later, at dinner with him and his wife on my first business trip to Boston, they encouraged me to visit a museum in every city I traveled to. His understanding that art recharges the soul, refreshes one’s perspective, and sparks new ideas stayed with me and I have, indeed, looked for museums everywhere I’ve gone.